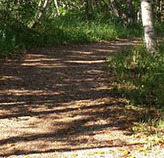 The City of Edmonton has an extensive network of trails and pathways throughout its neighbourhoods that require maintenance and upkeep. The City of Edmonton has an extensive network of trails and pathways throughout its neighbourhoods. Help us keep our trails safe and clean by reporting any maintenance needs. Report any maintenance needs on Edmonton trails, including sign concerns, wash outs, debris, etc. The City will assess the request and determine what service maintenance is required.